Kundali is the native's horoscope chart that is read to reveal his uture by the astrologers. We all are born under influence of stars who realign to change our future. Palmists would tell you your future by reading the lines in your palm too but presumably, the shapes of the lines change as per you garner new experiences in life and bet washed over by new beliefs or some new malaise that engulf you. The astrologers and palmist try to comprehend the codes hidden in those lines to guide you into the right decision that will change your life and stop things from turning adverse for you. There are many other ways a fortune teller would tell you your future such as tarot reading, palm reading, face reading or kundali matching. Kundali matching is the oldest form of fortune telling and it becomes an imperative in Indian households to match kundali of two natives who are tying the nuptial knot to decide whether or not this match was made in heaven and prosperity will be there in the relationship. In Indian subcontitent, middle class households are more slanted towards matching kundli, especially during marriage because it is the turning point of one's life and marriage establishes a bond between two families. It is a beautiful relationship between two souls that are going to stand by each other come hell or high water. When you are ready for this commitment, which is of a lifetime and choose your partner with whom you will share your pain and joy and together you will paint the town red, needs to be the one of your dreams. Kundali matching ensures that the person you will take the vows with was made for you. Your stars need to be compatible with each other so that the marriage doesn't fall in shambles in the time to come. 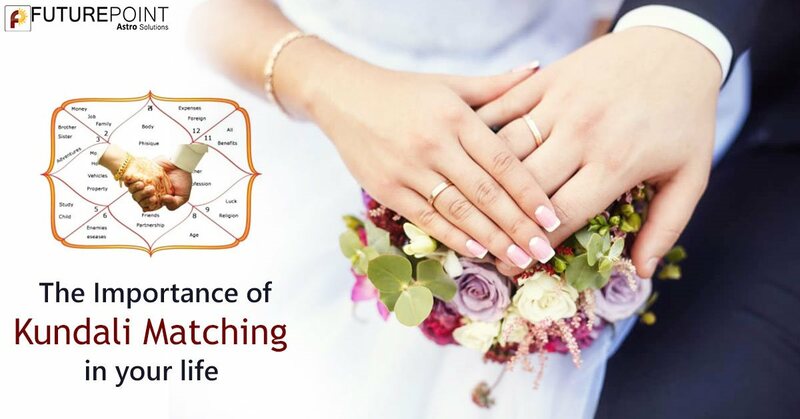 As per astrology, there are 36 gunas in the detailed birth chart of the prospective bride and groom that have to be matched to understand how compatible both the people are and how prosperous their marital life is going to be. As a marriage brings two families closer, kundali matching can't be trivialized because it bears a lot of significance in their bond also. Sometimes, a bride can't adapt to the ambience in her marital house because the family doesn't show much friendliness to her. It is a common phenomenon in India because the society asks the bride to share the same roof with her parents-in-law most of the time, in that occasion, a Kundali tells is the prospective marital house is compatible with the bride too. Being married means your destinies are tied together so both of your stars need to be judged for a longer camaraderie. That aside, if you see from the financial angle, kundali matching bears significance here too because there may be financial ups and downs the bride and groom who are going to set-up their love nest will face. Matching the Kundali assures you that come what may, they will be each other's mainstay and will keep the household rolling. The fundamental requirement of a happy household is love and trust for each other and when your gunas match, there is nothing that can stop you from running a happy household. Marriage is institutionalizing the biological relationship between man and woman so that the offspring they produce can assert legal right to his father's property. So the gist of the story is, people marry to bring successor to their property and the family hence it is necessary to comprehend whether the couple will be able to produce a healthy offspring in future and whether they will face any complications in doing so. Kundali matching is your answer to that concern. Not only gunas, there are dosas too in your kundali that can drift you apart in time. If you match your kundali at the time of your marriage, the astrologer may be able to tell you the ways to overcome the dosas and make your marriage a happy one. This factor is scientifically proven and very important for the individuals that are looking to tie the nuptial knot. It entirely depends on the timing and positioning of the stars that can create dosas in the natal chart of the prospective bride and groom such as Mangal dosa which makes you Manglik or Sani Dosa. However, you need not worry because there are infallible solutions to these problems and the astrologer will be able to tell you the perfect way out of this problem. If you like someone and the kundali is creating a roadblock, there are ways you can overcome the hurdles and lead a happy marital life together. There are many instances of Manglik people too are leading happy married life, take for instance, Aishwarya Rai. But then, you are required to visit an erudite astrologer to tell you how to curb the ill-effects of Mangal and make everything fall in order. If the astrologer detects any flaws in your kundali, he will do some pujas that are the solution of the said problem. It is believed that performing some rituals will blur the effect of those dosas and render your married life happy. Kundali matching can't be done without a knowledgable astrologer so you need to look for the best astrologer in Delhi who will provide you your money's worth. Marriage only happens once and you need to ensure its prosperity. For that, it is an imperative to visit an astrologer and match your kundalis before you take the plunge.